If inclement weather puts a damper on your outdoor grilling, move inside and try a cast-iron grill pan. The smell and sound of a delicious top sirloin sizzling on the outdoor grill is enough to make your mouth water. 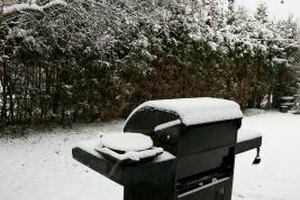 But sometimes the weather, lack of grilling fuel or even the lack of a grill mean that outdoor grilling is not an option. Enter the cast-iron grill pan, a ridged pan that does an excellent job of simulating the dry, high-heat cooking environment of an outdoor grill that you can use on your home stove top. Cast-iron grill pans typically lack the large cooking space of outdoor grills, so smaller cuts, like a top sirloin filet, are a particularly smart option for them. Season the steak liberally with salt, pepper and granulated garlic and let it rest for at least 40 minutes, up to 1 hour, at room temperature. Place the cast-iron grill pan on your cooktop and pre-heat it for at least 10 minutes. You do not need to add any oil to the pan before cooking. Brush the steak with a light coating of high-heat cooking oil. Place the steak in the grill pan and cook, flipping frequently -- at least every 60 seconds -- to ensure even cooking. The steak is ready to remove from the grill pan when it reaches an internal temperature of 125 degrees Fahrenheit for rare, 130 for medium rare, and 140 for medium. Note that the steak will continue to rise in temperature about 5 degrees while resting after cooking. For a thin steak, start checking for doneness -- using a meat thermometer -- after about 4 minutes of cooking. For a thicker steak, such as 1-inch thick or larger, start checking for doneness after about 6 minutes of cooking. Remove the steak from the pan onto a warmed platter and allow it to rest for 5 to 10 minutes before serving or cutting. Despite what you may have heard, constant flipping of steaks is a good idea. Frequent flipping -- ideally every 15 to 30 seconds or so -- ensures even cooking throughout the steak and reduces the likelihood that it will burn on the exterior before the center comes up to temperature. Cast-iron grill pans have a tendency to throw a large amount of smoke while grilling meats. Run your kitchen vent fan -- on its highest setting -- during the entire grilling process. The USDA recommends a minimum safe internal cooking of 145 F, with a minimum 3-minute rest after cooking, for beef steaks. This equates to somewhere hotter than medium and will result in a somewhat dried-out steak. You can grill your steak as done as you like it. Use care when handling any hot cast-iron pan. Unlike many cooktop pans, cast-iron pans are searing hot all over -- including the handle -- when fully pre-heated. Never try to pick up a cast-iron pan without some kind of protection, such as oven mitts or grill gloves, on your hands.